Ask not for whom the bell tolls, it tolls for Team Bondi. Team Bondi has had a rough couple of months. 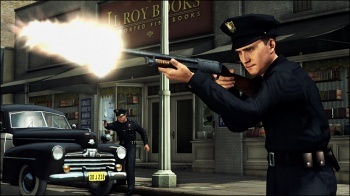 Despite releasing the well-received L.A. Noire, the Sydney-based studio has endured everything from investigations of employee mistreatment to possibly selling their entire company. Now, the company has entered into administration, placing it one small step away from total bankruptcy. In legal terms, a company that is "in administration" has essentially relinquished control of its assets to a court or a court-appointed third party. In this case, the Australian accounting firm deVries Tayeh has appointed administrators to oversee Bondi's resources. Companies that enter administration are usually on the brink of financial insolvency. Being placed in administration - or even declaring bankruptcy - by itself is not enough to doom some companies, but the prospects for Team Bondi look bleak. According to Australian financial site SmartCompany, Bondi's offices have "moved" without any forwarding address, and there were no PR representatives to answer their inquiries. KMM Studios, Bondi's supposed next port of call, had no comment on whether the developer had actually sold them intellectual property and assets. Between poor working conditions, lack of recognition for developers, and publisher Rockstar never wanting to work with Team Bondi again, the studio is probably not long for this world. The future of the L.A. Noire IP is still up in the air.